A new Barbara Hepworth exhibition seeks to offer a fresh perspective on one of Britain's best-known sculptors. The show, which opens at Tate Britain on Wednesday, is her first major London retrospective for almost 50 years. It brings together more than 100 works including her earliest carvings, major sculptures and previously-unseen photos from her studio. "I think there's more interest in her now than there was 25 to 30 years ago," said Tate director Penelope Curtis. Hepworth, whose artistic career spanned five decades, was born in Wakefield, Yorkshire, in 1903. Her love of landscape came from drives around West Riding with her father in the course of his work as county surveyor. She was inspired to become a sculptor after seeing a slideshow of Egyptian art at school. She studied at Leeds School of Art from 1920-1921 where she first met fellow Yorkshire-born artist Henry Moore. In 1949 Hepworth bought Trewyn Studio in St Ives where she lived until her death in an accidental fire in 1975 at the age of 72. One of her best known works is Single Form (1961-4) a 6.4 metre-high bronze which stands outside the United Nations building in New York. Curtis, who co-curated the Tate show, said one of its key aims was to emphasise Hepworth's prominence on the international art scene. "People in Britain tend to think of her as a rather British artist," she told the BBC. "Henry Moore has never been seen as a sculptor from Hertfordshire even though he was there for 40 years, but Barbara Hepworth has always been connected to St Ives. That's true - but it's not the whole story, so we felt that one major corrective we could make was to think about her internationally." The exhibition opens with Hepworth's earliest surviving carvings, including Doves (1927), which appear alongside works by Moore and Hepworth's first husband John Skeaping. It also features never-before-seen photo albums which offer an insight into her home and studio life with her second husband and fellow artist Ben Nicholson. One corner of the exhibition tells the intriguing story of when, in 1947, Hepworth was one of six artists - including Henry Moore - invited by London County Council to submit designs for four monumental sculptures situated on Waterloo Bridge. "Hepworth spent a great amount of time sitting on the bridge observing people as they went past," said Tate assistant curator Inga Fraser. "She was incredibly excited by the competition, which was plagued with difficulties from the very beginning." Eventually, none of the submissions were accepted and the plinths remain empty to this day. In the post-war period, Hepworth's sculptures became a prominent feature on the international scene. The latter part of the exhibition reunites four large works in African hardwood guarea (1954-5) which many see as the high point of Hepworth's carving career. Each is named after places Hepworth visited on a trip to Greece after the death of her son, Paul Skeaping, in an RAF plane crash over Thailand. 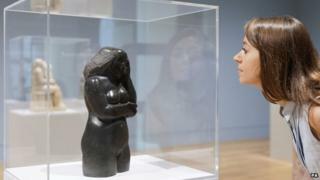 The last room displays bronzes from her 1965 retrospective at the Kroller-Muller Museum in the Netherlands, with a partial reconstruction of the pavilion where they were shown. At Monday's press launch, Curtis revealed that there had been a search across Europe to source the "right kind of brick" for the reconstructed pavilion. However, the bricks were eventually obtained from a builders' merchant in Vauxhall - just a short hop across the Thames from Tate Britain. Barbara Hepworth: Sculpture for a Modern World is at Tate Britain 24 June - 25 October 2015 (admission charge)- it tours to the Kroller-Muller Museum, Otterlo, this autumn and to the Arp Museum, Rolandseck, in Germany next year.